Enduring the process of applying for Social Security Benefits can be extremely stressful to any person. Fortunately, we are here to help ease your mind and speed up the process. In this blog, we are going to cover five frequently asked questions and other facts about Social Security Disability Income. ONE: What Conditions Qualify for Disability Benefits? One of the most common questions we hear when talking to social security disability candidates is this: “What disabilities qualify for benefits?” One way that the Social Security Administration answers that question is by using a Listing of Impairments (Part A) also known as the “Blue Book.” The Blue Book has several categories and is then broken down to sub categories. The Blue Book also has a Listing of Impairments for Children (Part B). The children’s Listing of Impairments is broken down into main categories and sub categories as well. TWO: My Disability is listed in the Blue Book. Do I Still Need an Attorney? You may have a disability that is displayed on the Listing of Impairments, but may not be seen as “severe enough” by the SSA to fulfill eligibility requirements. Your disability must then be proved “severe enough” to qualify. Even if your disability is listed, your benefits are not automatic. By hiring an experienced Social Security Attorney, you are letting go of the reins and letting a professional take over. So many people have had applications denied because of mistakes on their applications. Don’t let this happen to you. THREE: My Doctor Says I am Disabled. Why do I Keep Getting Denied by the SSA? The SSA may have denied you for medical reasons. In order to prove you have an impairment that is found in the Blue Book, you will need to obtain proper medical evidence that supports what you have claimed to be disabled for. Your attorney can obtain this medical evidence by requesting medical records, reports and more from your doctor(s). FOUR: What is the Importance of My Attorney Getting Medical Records for My Case? Claims for Disability benefits are approved or denied based on medical evidence. Medical records establish the severity of your impairment and helps the SSA understand your disability. This can be a report from your doctor stating things that you CAN do, despite your impairment. If your application lacks these key evidence types, your claim could be denied. An attorney can request these medical records for your claim and help your claim get approved. FIVE: Can I Work While Getting Disability Benefits? SSDI recipients generally can’t do Substantial Gainful Activity (SGA) while receiving full benefits. The SSA describes SGA as “A term used to describe a level of work activity and earnings. Work is “substantial” if it involves doing significant physical or mental activities or a combination of both.” They describe “Gainful” Work activity as “Work performed for pay or profit, work of a nature generally performed for pay or profit, or work intended for profit, whether or not a profit is realized.” Your eligibility for SSDI benefits depends on whether or not you are able to do SGA. SGA has two parts. Hours worked and income earned. If you work more than 20 hours per week that is SGA and will cause you to be ineligible to received benefits. According to the SSA the income portion of SGA for 2018 “for statutorily blind individuals for 2018 is $1970. For non-blind individuals, the monthly SGA amount for 2018 is $1180. SGA for the blind does not apply to Supplemental Security Income (SSI) benefits, while SGA for the non-blind disabled applies to Social Security and SSI benefits.” In other words, if you are a non-blind individual, you can make up to $1,180 per month while receiving benefits and for blind individuals, you can receive up to $1,970 per month while receiving benefits. According to the history of SGA amounts, they have slightly increased almost every year since 1975. This is because the amounts change based on the National Average Wage Index. If you are concerned about your application to the Social Security Administration for SSI or SSDI, call Lawrence & Associates to talk to one of our trained intake specialists about setting up a completely free consultation to talk to one of our Social Security Attorneys. 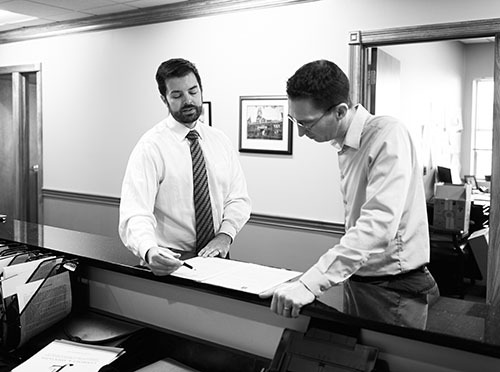 Lawrence & Associates will be with you every step of the way and will help you fight for your benefits. We practice Social Security in the states of Ohio and Kentucky. Call us today to find out how we can help you now!